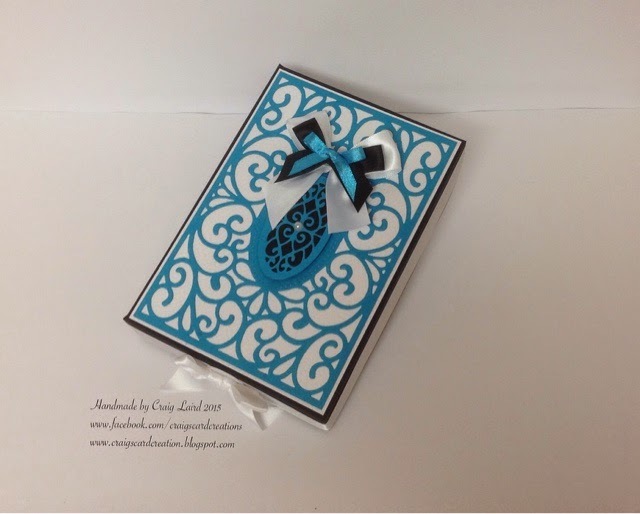 Crafting With Craig: Turquoise Delight - 8x8 16th birthday card. Well it's the start of the week again! Where is the time going. Not only the start of a new week but we are into another month already. May time nearly half way through 2015. Scary thinking about it, even more scary for me as next month I'll be turning 30! Eek. I say eek but it actually doesn't phase me atol. Saying that, I won't be here to think about it. I'll be spending the week of my birthday in NYC! I place I have always wanted to go and seeing it's a big year for me, we booked New York last year. The count down is on. 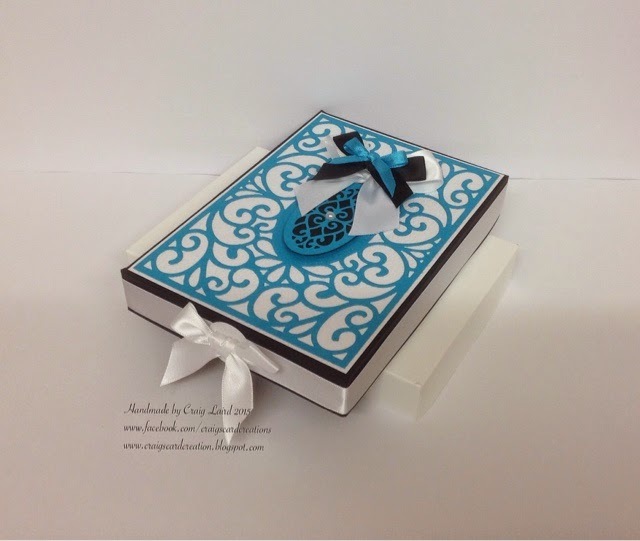 Another special age to turn is 16 ( I remember that) so with PaperMill Direct new promotional card stock - Turqoiuse at 250gsm where you get a small box for £4.50, I have made not only an 8x8 card for a girl using the PMD card but I have also made a keepsake box which is all made using the same die collection (see below for details) even the box has been made using white card stock from PMD. It's not a typical colour scheme you would think for a girls16th birthday card, but I think it works the combination of White, Black and Turquoise really helps to make this card stand out from the rest on the mantelpiece. This card has a lot of die cutting involved and a lot of handling due to it constantly being placed inbetween the die cutting plates. The White die cut background has been run through my Grand Calibur 16 times. It has been die cut 8 times to create the background but I have also embossed it after each run through of the Grand Calibur. What makes this even more spectacular is that I have White Seal Embossed card stock by PMD and the whole texture and embossed look has stayed perfectly in tacked, even after 16 run throughs. 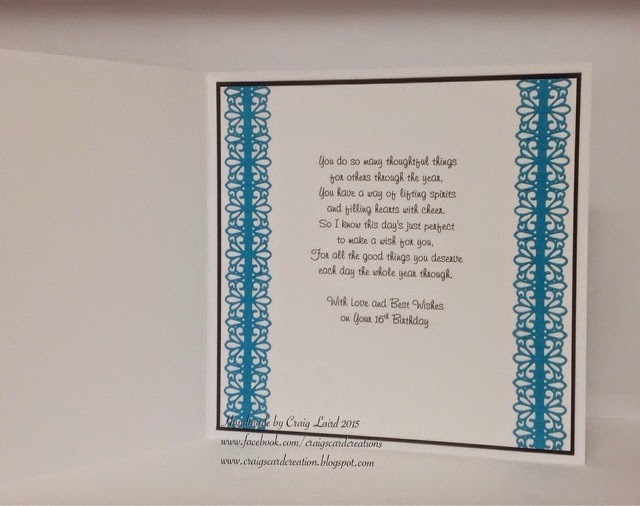 You will be able to see in the photos that there isn't any wear and tear, cracks or creases, disfigurement of the card stock - it is perfect and that's the quality of the card that PaperMill Direct produce. You can be rest assured that when ever you purchase PMD card stock whether your regular buyer or a new buyer you will be guaranteed a perfect finished fro. The first die cut to the last die cut. The die collection I have used is Sue Wilsons die collection and it is part of her Scandinavian die collection. I am relatively new to Sues collection, infact this collection is the first die collection I have purchased. I have recently purchased others that you will see on previously blog posts. 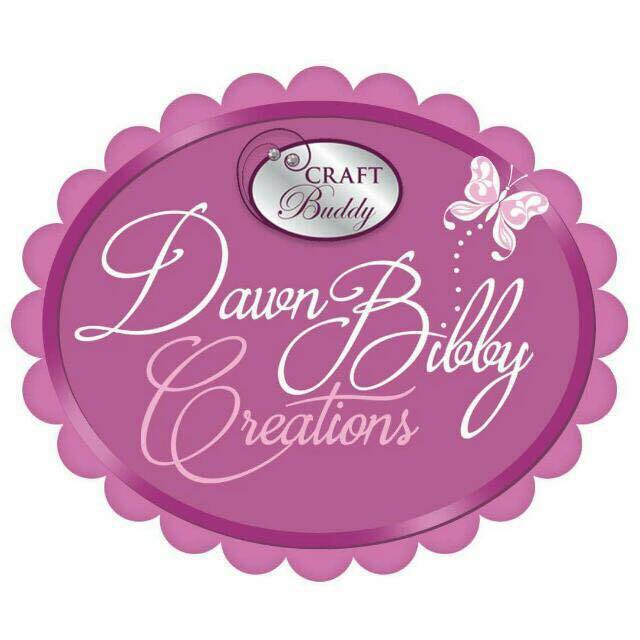 I am in love with them, they are so easy to use and the cut is simply perfect, no wax paper needed and if using the junior spellbinder plates like I do, they nearly cut first time. With the exception of a few occasions. Also when buying a full collection like the Scandinavian collection, they all mix and match with each other. Many of the shapes are the same maybe just abit larger or smaller but the full design is different which means you can mix and match from each collection and mat and layer together to give multiple different looks. 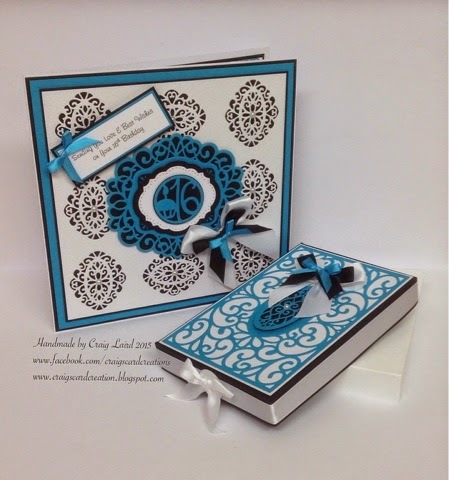 To create the box I have used the same colour card stock with the exception of the White Seal card. 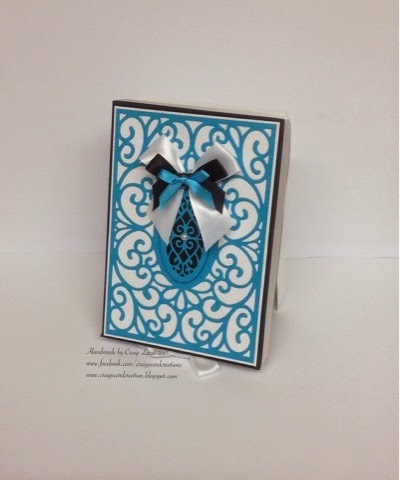 For the box base, I have used PMD plain white card. For the main lid I have used the Black card stock. Both of which construct perfect. When scoring and bending the card stock, there is no cracks showing, there's no firbers showing there's just perfect creased and scored lines. This shows that PMD card stock works so well when it comes to construction. I genuinely believe and feel that the combination of PMD card stock and Sue Wilsons die collection really do work perfectly together. 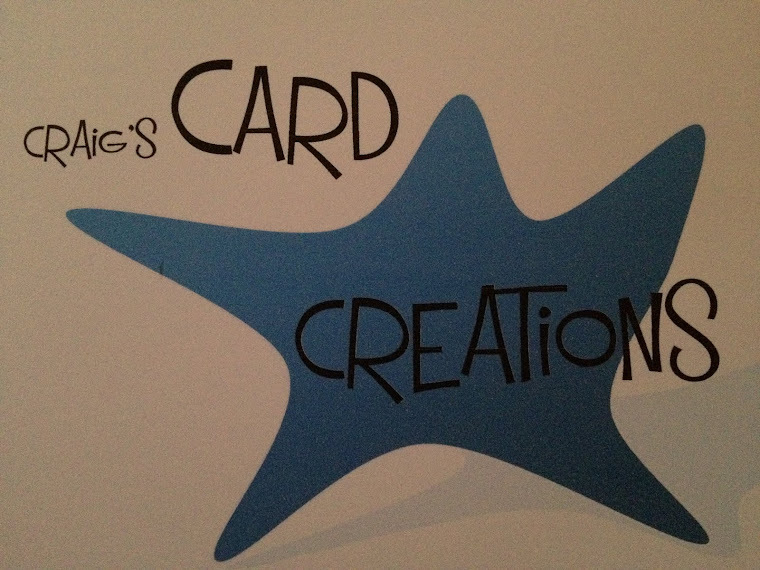 If you could see the many card samples I have made using these two together, you will see that this is a genuine beliefe I have. White Seal Embossed card - 230gsm. 6mm double sided polyester ultra sticky tape - S56947. 19mm x 38mm x 2mm foam pads - S57137. 8x8 cello bag - K624. 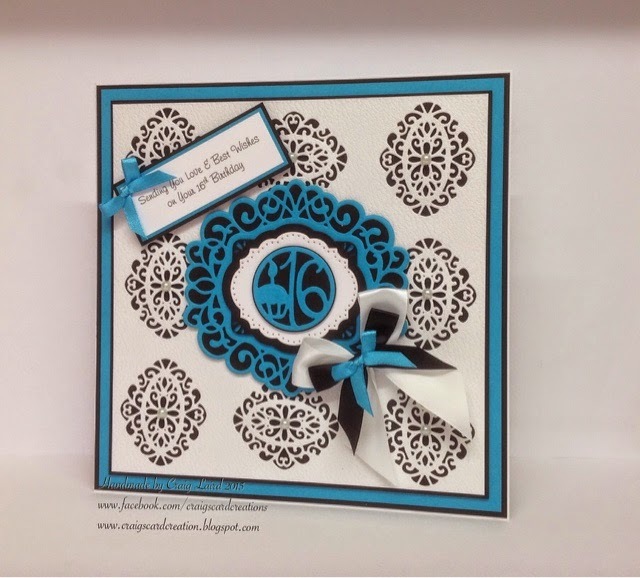 16th die from pop up set - Tonic Studios. 13mm black satin ribbon - American Crafts. 6mm turquoise satin ribbon - American Crafts. 5mm blue tint pearls - Mei Flower. Large score board - Crafters companion.